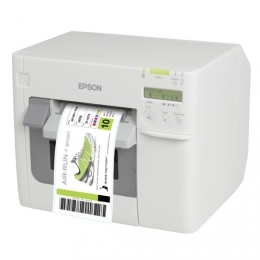 A high degree of flexibility for minimal costs the desktop label printer ColorWorks C3500 from Epson is an inkjet printer for in-housing printing of colour labels on demand. Meet the ideal demands for materials to be produced short-term, or for printing on pre-fabricated labels. The ColorWorks C3500 is designed for various matte, glossy and film-coated labels, tickets and price tags with a width of 30 to 112 mm. Thanks to its four separate colour cartridges it prints especially economically. Flexible choice of media matte, glossy, film-coated, PE labels for GHS applications, etc. Optimal print results at 103 mm/sec. at 360 dpi are ensured by Epsons long-lasting DuraBrite Ultra pigment ink, which easily resists water and moist wiping. The ColorWorks C3500 is particularly user-friendly it contains an LCD display, which provides continuous print and ink status, and it is operable entirely from the front. Thus, placing it under the table or on a shelf is possible. Connect the ColorWorks C3500 easily via USB interface, or turn it into a network printer via Ethernet interface.